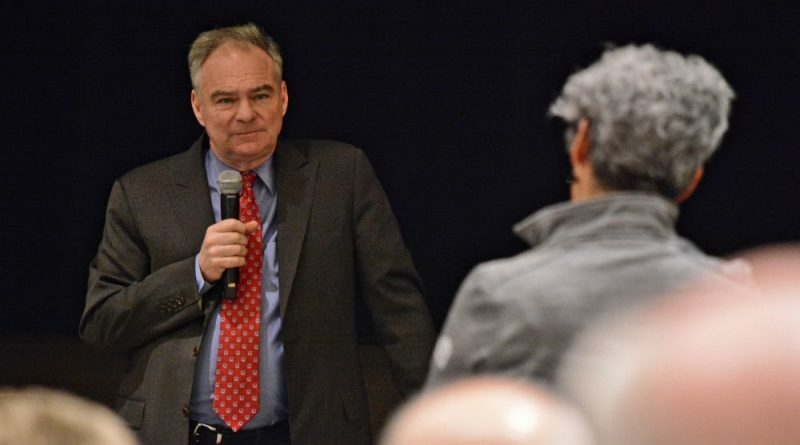 Sen. Tim Kaine (D-VA), who will be back on the ballot in 2018, came to one of Loudoun’s largest retirement communities for a town hall meeting Monday. Ashby Ponds residents challenged Kaine with questions on a range of national issues, many revolving around diplomacy and the military. When one resident questioned a $90 billion increase in military spending, Kaine said he supported that increase. But in response to other questions, he expressed concern about the direction of American diplomacy—particularly President Donald J. Trump’s apparent undercutting of Secretary of State Rex Tillerson on Twitter, tweeting insults at foreign leaders, and the great number of empty staff positions in the State Department—including the ambassador to South Korea. He also said Congress needs to reclaim its authority over prolonged military engagements. While the U.S. has been in constant conflict since 2001, the last military action explicitly approved by Congress was in Iraq in 2003, and the last formal declaration of war was World War II. “We owe it to the men and women who risk their lives that we have a vote to establish that it’s in fact a national priority before we order them to go risk their lives,” Kaine said. And while he said the U.S. has some of the best cyber professionals in world, he said the U.S. may need to reorganize its cyber warfare operation. He mentioned the idea of a separate branch of the military dedicated to cyber warfare. American intelligence agencies have concluded Kaine’s own run for vice president alongside Hillary Clinton was victim to attempted tampering by a Russian cyber effort. “I’m going to be on the ballot in 2018, I’ve already been tinkered with in 2016, I don’t want it to happen again,” Kaine quipped. But he dismissed any talk of a presidential run of his own. In particular, he pointed out the extraordinary security measures with presidents and presidential candidates live. “I like taking my wife out for a surprise birthday and not having to clear the whole restaurant and have a food taster,” Kaine said. Kaine is not good for the USA, Virginia or the counties therein only the party. Your life is not better because he has been a elected official, only his life and that of other political hacks in the democrat party. Trump has it correct when he refers to the swamp and draining of flotsam like Kaine. How many great accomplishments legislatively by Kaine? If Kaine was paid by the piece he would ne going hungry. I guess you can call a increased national debt a accomplishment for Tim. Not millions, not billions but trillions with a ‘S at the end is what Kaine and Warner and Comstock have added. We can hope people have had enough of the democrat good old network and will elect Stewart because he is a better choice. The whiners about bombastic had 8 years of kool and see what that got us. Kaine is a placeholder at best and not worth 180k$ a year.